"You must have the music in your heart before you play it on your strings"
Ron Radford has ducked bombs in Vietnam, strolled with Spanish gypsies. He has strummed with the best in Mexico cafes and brought American audiences close to religious ecstasy. 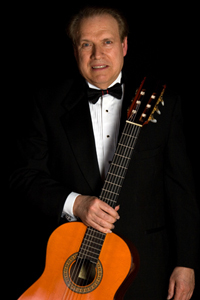 Radford is lyrical of touch and tongue, being a premiere flamenco guitarist and a charming host on the stage. Like many great performers, he takes responsibility for his talent but gives the credit to what he calls "the Source." Humility, he allows, "is being willing to be the effect of the one Cause, not the Cause itself." Through at times incredible series of coincidences, Radford finds himself a master flamenco player today instead of a backup man for a rock band. Until age 17, he was a rock band enthusiast, a Chet Atkins devotee. Then he says, he heard a recording by Carlos Montoya, the gypsy guitarist who has done much to introduce the soul music to America. "It was like a revival of spirit," Radford recalls. "And at the end of that year, I met Montoya in Tulsa. I didn't know it, but the song I played for him was a deep song, one of the most difficult of the Spanish gypsies. He was surprised that this kid from Oklahoma could play it, and he picked up his guitar and joined me. His wife came out and clapped and we had a jam session." Radford was mostly self-taught at that point. An impressed Montoya offered the Oklahoman a position as a private student in New York. Radford took it, just as he took a Fulbright Scholarship to Spain, another scholarship for travel among the Spanish gypsies, a tour in the Army that allowed him to entertain in Saigon as well as the rice paddies. He wasn't playing the guitar. It was playing him. His style has been called remarkably authentic for an American. While other students had problems getting close to the gypsies, Radford says he simply learned to listen. He shared their secret almost intuitively: he played from the heart. "When I heard that first flamenco record, I recognized something that was honest and true," he recalls. "I was instantly impressed by it. There was something about the spontaneity, the artistic surrender that appealed to me." Since flamenco guitar is an oral tradition passed from person to person among the gypsies, Radford found his skill at learning by ear valuable. The gypsies liked him for it and he found them easy to like. Because of his gypsy friendships he eventually found his way to the flamenco festivals known only to the aficionados. He listened and learned and occasionally offered his car as a cab for; the gypsies who needed a ride. "I think that was the time I moved ahead in all fronts," he says of his gypsy life style: "Both technically and spiritually, I found myself experiencing and being part of a folk art form, rather than an outsider." It's the same universal source of music, whether it's in Vietnam, Japan, and France or among the gypsies." "The gypsies have a word, duende, or 'soul.' The flamenco people are happiest when the excitement and spirit takes over and leads them, pulls them into something else. It's that unity of spirit that happens. During times of inspiration, I have a feeling of total unity. It's not me and the music and the guitar and the audience. All the 'ands' are removed." Any more discussion on such secrets is halted by Radford, who will protest, "I am not ready to explain more. That's an intellectual activity and flamenco is a spiritual revelation. Montoya also said once, "You must have the music in your heart before you play it on your strings"
But Radford cannot resist. Genuine humility spills over and he adds, "What I feel is, playing is a gift. Jenny Lind once said, 'I never have but one in my audience. I sing straight back to God who gave me my voice.'"